The government of Bahrain has had a busy few weeks, pushing ahead with a reform agenda against a backdrop of continuing unrest. In recent days, King Hamad Bin Isa al-Khalifa has announced constitutional reforms that are intended to lead to greater accountability, ordered the rebuilding of mosques knocked down by the government, and appointed two distinguished British lawyers to overhaul Bahrain's judicial system. And the government has said it is reinstating people who lost their jobs because they had supported the protests. All of these steps are intended to reassure Bahrain's Western allies - and its own people - that the country is committed to carrying out the recommendations of a group of international human rights experts. When people are killed and wounded in the streets, rounded up and tortured, sacked from their jobs for asking for freedom -how can you call these mistakes? The Bahrain Independent Commission of Inquiry (BICI), which was chaired by the distinguished Egyptian lawyer Professor Cherif Bassiouni, released a damning indictment of King Hamad's government in November. Its report documented numerous human rights abuses and systematic torture of detainees by security forces as they put down anti-government protests last February and March. 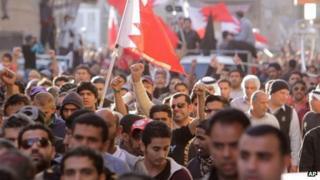 The BICI also examined the cases of hundreds of employees who were sacked for allegedly supporting the protests. Most of those affected were Shia Muslims. Bahrain's ruling Al Khalifa family are Sunni Muslim, while the majority of the Gulf state's population - and those who have been attending anti-government protests - are Shia. Longstanding Shia resentment over discrimination in the kingdom helped trigger the months of unrest last year, during which more than 50 people were killed. The BICI, commissioned by the king, was seen as an attempt to defuse tensions between the government and the Shia community. Commenting on the government initiatives, businessman Zayed al-Zayeni says: "We have to move forward, the country has to move on." Mr Zayeni also serves as chairman of the motorsport venue Bahrain International Circuit, and is keen to get events like Formula 1's Bahrain Grand Prix back on track. He says that in line with recommendations from the BICI, the circuit welcomed back on Monday staff members who had been sacked in connection with last year's unrest. "Based on his majesty's instructions we have called them back and there will be no mark against their record," he adds. Mr Zayeni says that the government has acknowledged its mistakes but that everyone has to "take a step back". "The government has done that with the [Bassiouni report], but I have yet to hear the opposition say they have made mistakes," he adds. He describes King Hamad's efforts to achieve reconciliation through national dialogue as being essential to Bahrain's survival. But the veteran Bahraini human rights campaigner, Nabeel Rajab, says that there has been no meaningful dialogue with the opposition. Image caption Nabeel Rajab says King Hamad is the biggest obstacle to any meaningful dialogue. "What dialogue are you talking about?" he asks. "There is no dialogue." Mr Rajab, the president of the Bahrain Centre for Human Rights, believes King Hamad is the biggest obstacle to any meaningful dialogue. "He set the terms about who would be a part of it, what they were to talk about, and when they were to report," he adds. Mr Rajab also dismisses the recent government statements admitting mistakes were made and saying it is time for the country to move on. "These are not mistakes. These are crimes," he says. "When people are killed and wounded in the streets, rounded up and tortured, sacked from their jobs for asking for freedom - how can you call these mistakes? These are crimes and the people responsible are going unpunished." And activists say that abuses are continuing. They cite crackdowns on peaceful marches and the death of a protester in late December as further evidence that, despite government claims, security forces are still behaving with impunity. Fifteen-year-old Sayed Hashim Sayed Saeed died when he was allegedly hit in the face by a tear-gas canister fired by riot police. The government has said it is investigating the incident. Is the 'sale' of a baby ever OK? Is Europe seeing a nationalist surge?